The 9 where I boarded it. I picked up the empty bus at its second stop (not including the “bus terminal”), P Street @ E 2nd Street. We continued down P Street in a residential area, then turned onto E 4th Street. There were some businesses as we came onto East Broadway, then we turned onto West Broadway, leaving the 10. West Broadway had many small businesses, then we turned onto A Street just shy of Broadway Station. 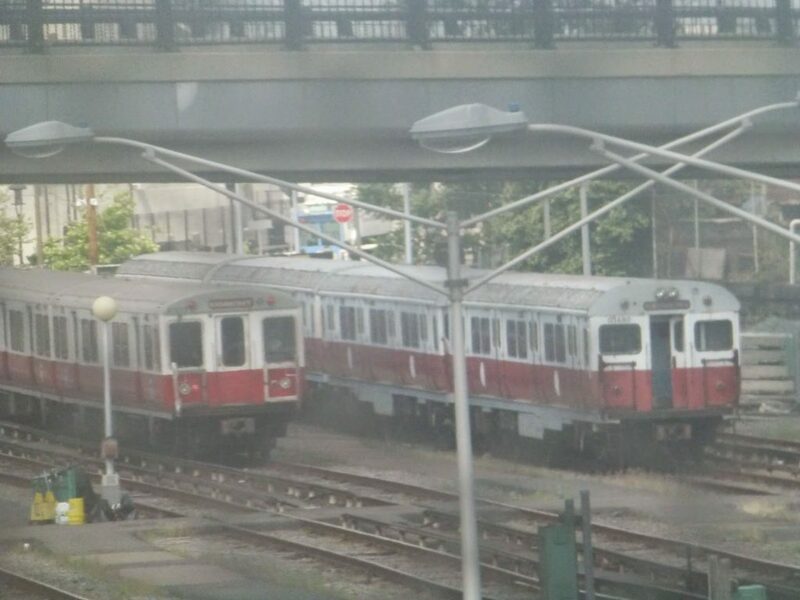 On the right is the last set of 1960’s-era 01400 trains on the MBTA. They’re used as work cars now. 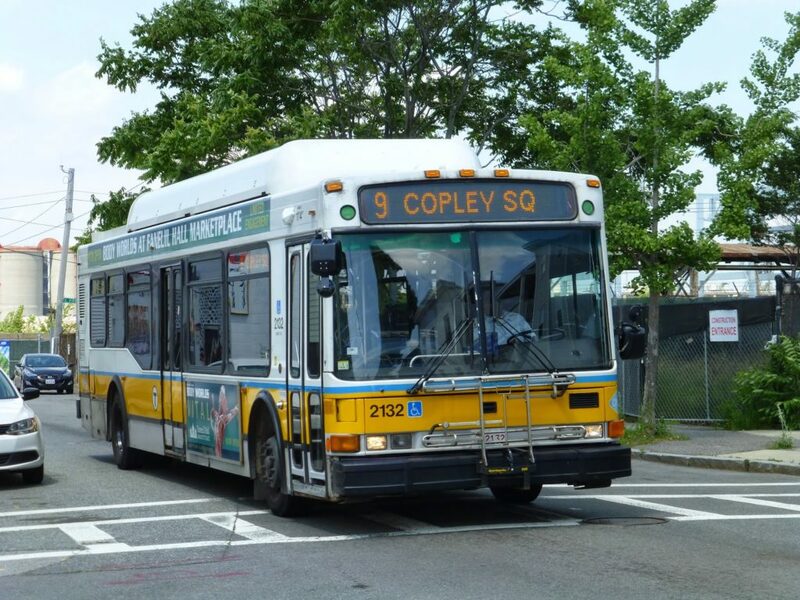 At this point the 9 takes an interesting routing that I’m pretty sure the street map on the MBTA website gets wrong (it doesn’t matter too much to the rider – it just seems to show the bus looping the wrong way). Turning onto Dorchester Ave, we made the stop at Broadway, then went onto Gillette Park and then Foundry Street. After going right next to the Red Line’s Cabot Yard, we turned onto Greenbaum Street, then Dorchester Ave, and then onto West 4th Street and its bridge. There weren’t any stops on this loop, so it’s a bit annoying how complicated it has to be. Heading towards City Point is much more straightforward, omitting the loop entirely. 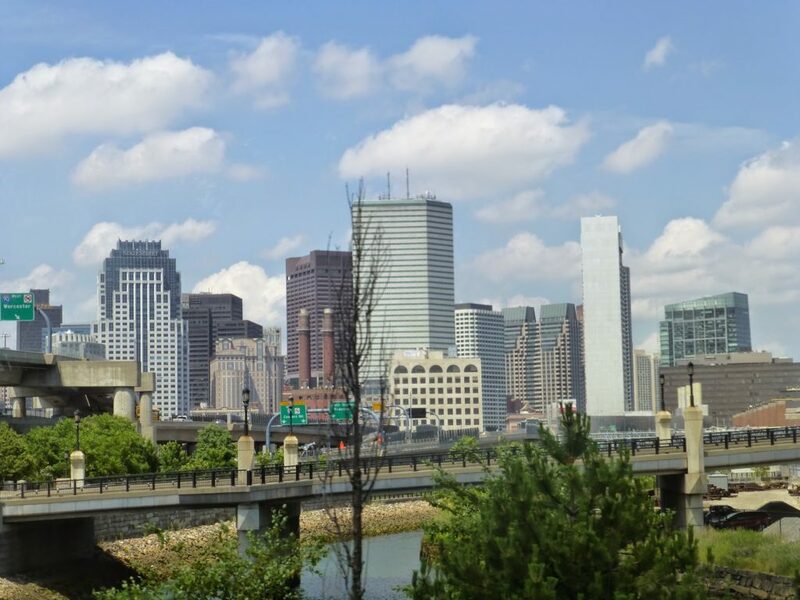 We then went over the 4th Street Bridge (where the picture above was taken) and under I-93. From Broadway to Copley the 9 operates in a loop, with the inbound services going via East Berkeley Street (and outbound going via Herald Street). It was a weird, almost industrial neighborhood, but after going by some projects we entered into the beautiful South End and its old-fashioned brownstones. Crossing over I-90, we went by the Old John Hancock Building and a building reminiscent of the Flatiron in New York. We then turned onto St James Ave, going by the Hancock Building itself and through Copley Square. I actually stayed on the bus as it went onto Huntington Ave, Ring Road, and Boylston Street, coming back on the other side of the Square where I got off. Ridership: Like I said at the disclaimer at the beginning, there were only seven people who rode on my trip. But again, the buses going the other way would be extremely crowded. Presumably I was going in the wrong direction for ridership. 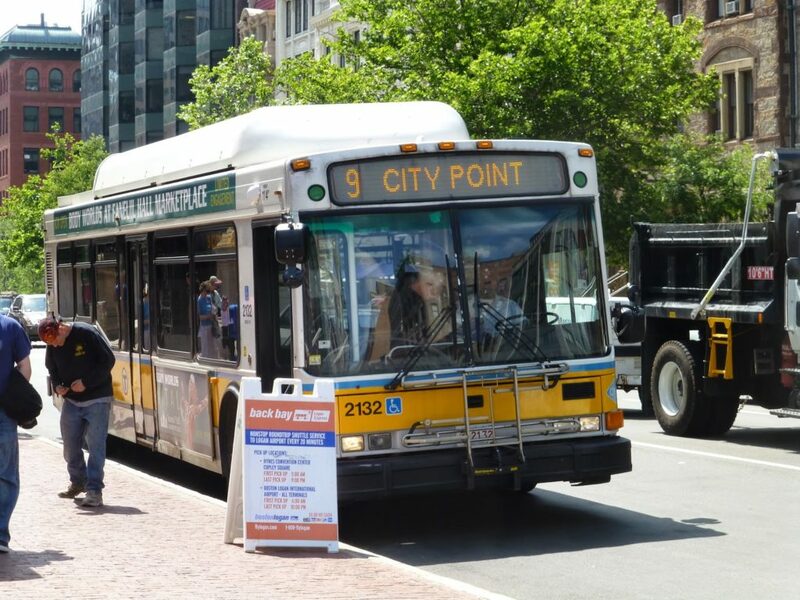 Pros: The 10 also goes from City Point to Copley, but the 9 is quicker, more direct, and runs much more often. In fact, it’s every five minutes during rush hour! During the day it’s every 15-25 minutes, every 25 minutes during the night (with the last trip departing Copley just shy of 1 in the morning), every 20-25 minutes Saturdays, and every half hour Sundays. Overall, that’s a pretty good schedule for a non-key route. Cons: The only thing I don’t like about this route is that loop at Broadway. Maybe there’s some traffic law I don’t know about, but it seems like the route illustrated in this map would be easier – it cuts the trip in half! Nearby and Noteworthy: This bus goes right by the Medieval Manor, which is apparently a very fun medieval-themed restaurant (I’ve never been myself). I would give it a 9, but the fact that there’s a simple solution to the inbound Broadway route lowers the score. Does the MBTA not want two Broadway stops (the current one is shared with the 11 and 47)? If you know why the routing’s so weird, please drop me a comment below. Real-time tracking is coming to the Green Line! I hope it gets countdown clocks, too. Hello. You should take this bus on a weekday during rush hour. The score will drop dramatically! It's a can of sardines – both ways. The bus often skips stops on the route because it can't accommodate one more person. Even when the buses are running 5 minutes apart, this is a problem. The #9 can be a real pain! Really? Where are all the people going? Maybe they could have every other bus cut back to Broadway to ease ridership. The loop is for safety of passengers–if the inbound dropped across the street, pax would have to cross the street to get to Broadway station–with no other entrance option to the station, the loop is probably cheaper than building an entrance across the street. Agree, the 9 is packed inbound during the morning rush and packed outbound in the afternoon rush.